The New England Journal Of Medicine recently reported on a couple of cases of "transient smartphone blindness". Short version: Some patients were coming to their doctors after recurrent episodes of temporary loss of vision at night, only affecting one eye. The patients underwent testing (including expensive MRI scans), and in one case started on medication for presumed blood vessel issue. 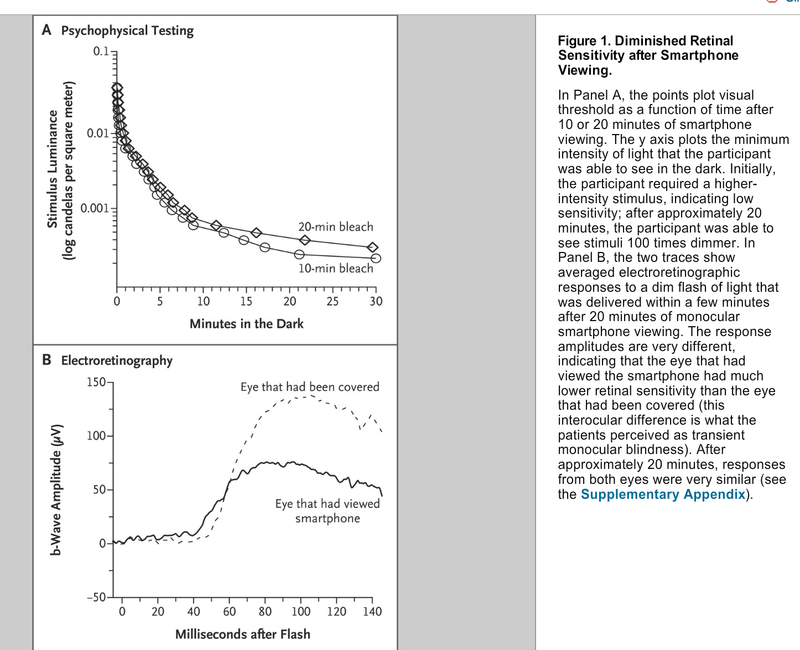 But the transient blindness was caused by the fact that the patients were reading their smartphones at night with one eye. Hence, the reading eye was exposed to light whereas the other eye remained adapted to the dark. 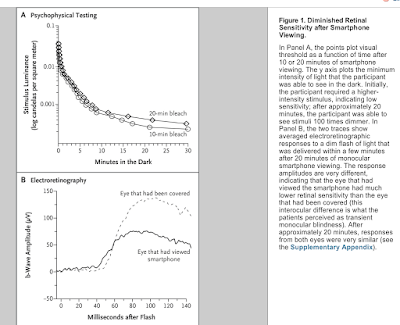 When they shut off their phones, the phone-reading eye was relatively "blind" compared to the other dark-adapted eye and needed a few minutes to recover. The doctors even ran an eye sensitivity experiment. When the patients were seen in our neuro-ophthalmic clinic, detailed history taking revealed that symptoms occurred only after several minutes of viewing a smartphone screen, in the dark, while lying in bed (before going to sleep in the first case and after waking in the second). Both patients were asked to experiment and record their symptoms. They reported that the symptoms were always in the eye contralateral to the side on which the patient was lying. Although most people view screens binocularly, people frequently use smartphones while lying down, when one eye can be inadvertently covered. Smartphones are now used nearly around the clock, and manufacturers are producing screens with increased brightness to offset background ambient luminance and thereby allow easy reading. Hence, presentations such as we describe are likely to become more frequent. Our cases show that detailed history taking and an understanding of retinal physiology can reassure both patient and doctor and can avoid unnecessary anxiety and costly investigations.